I’m late. No, I’m not pregnant. By late, I mean I am posting day 367 on day 368. Please forgive me. ‘Sunshine’ is the name my boys call a certain John Denver CD we have in the car. We listen to the CD every time we get in the car. 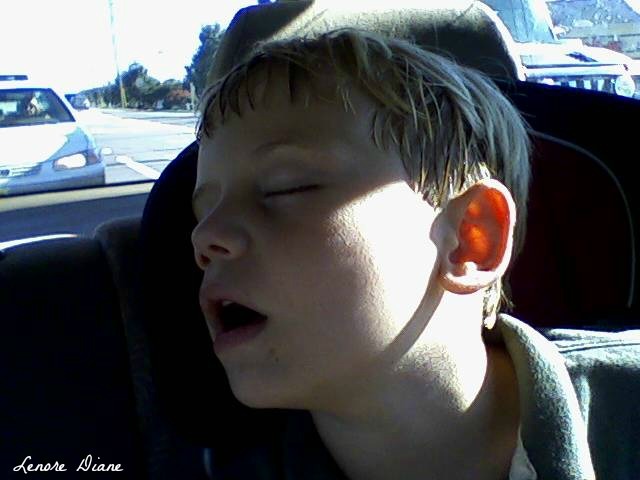 If the boys are coming home from church, school, or a friend’s house, they fall asleep before the first song ends. Yesterday was no different. Annie’s Song is a wonderful song, BD. I like “For You”, which may not be as popular but it is as beautiful. And, I think it is a combo innocent/exhaustion. And then you turned on Eminem. love those requests for John Denver. He’s the best, Stacia. I am thrilled my boys request his songs. My sister would LOVE you! She is a huge John Denver fan. Huge! What a sweet picture and I bet the song is “Sunshine on my Shoulder” or whatever the real name of it is. I, too, am a huge fan. I have a boxed set of his CDs, and each CD is the name of one of his popular songs. “Sunshine on my Shoulders” being one of the songs/CDs. The funny thing is – the boys want me to skip the first two songs, including ‘Sunshine’. They like to start that particular CD with his song “Amazon”. I love his music, too. Of course, I’m from “Almost Heaven, West Virginia.” 🙂 Boxed set? Hmmm. I usually catch the PBS special featuring his music when they air it. I watch that PBS special all the time, Patti! I’ve yet to make a donation and snagged a thank-you gift, but I do enjoy the show. Nothing more precious than a sleeping child … lil’ angel. Lil’ angel when sleeping, at least. I’m going to play the John Denver CD in the car this afternoon. Thanks for the reminder. I hope you pulled out your JD CD and enjoyed his music, Charles. We rotate between three of his CDs. I love the fact that my kids like listening to his music. And, I chuckle at your daughter’s questions. My boys have asked similar questions, too. Kids are awesome.